Focus on the financial concepts, skills, and technological applications that are most critical for MBA students in today’s workplace with Ehrhardt/Brigham’s CORPORATE FINANCE: A FOCUSED APPROACH 5E. The text provides an in-depth treatment of essential corporate finance topics within a streamlined presentation that you can complete in a single semester. With its relevant and engaging presentation and numerous examples, your students will learn the latest financial developments as they also learn how to maximize a firm’s value in today’s changing business world. Students will master the many features and functions of spreadsheets with chapter Excel® Tool Kits, Build a Model problems, and Mini Cases that encourage “what-if” analysis on a real-time basis. Students will also gain hands-on experience using Thomson ONE Business School Edition, which gives students access to the same Thomson Reuters Financial database that business professionals use every day. 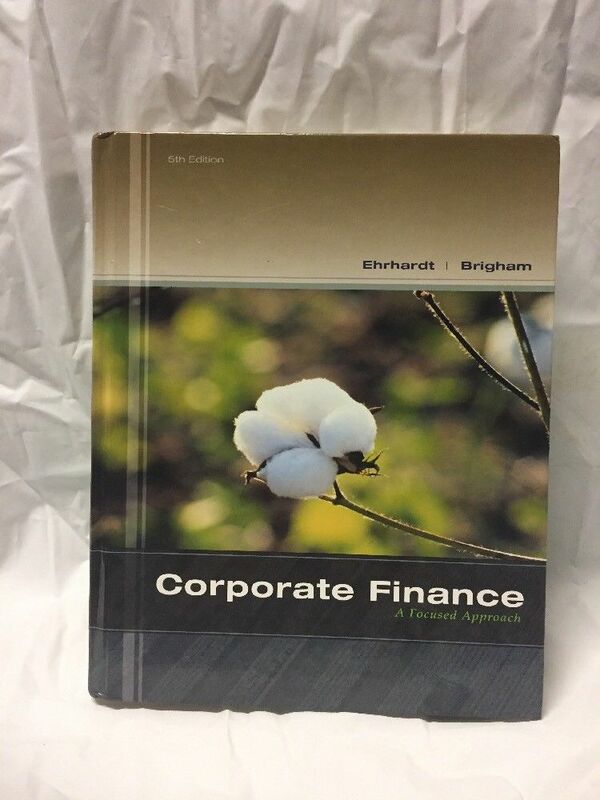 As part of its comprehensive product package, Ehrhardt/Brigham’s CORPORATE FINANCE: A FOCUSED APPROACH 5E includes CengageNOW and the best-selling Aplia Finance as optional learning solutions that complement the book’s focused presentation of corporate finance fundamentals, support your course needs and outcomes, and help your students become “First in Finance”. PART I: FUNDAMENTAL CONCEPTS OF CORPORATE FINANCE.1. An Overview of Financial Management and the Financial Environment.Web Extensions 1A: An Overview of Derivatives; 1B: A Closer Look at the Stock Markets2. Financial Statements, Cash Flow, and Taxes.Web Extensions 2A: The Federal Income Tax System for Individuals.3. Analysis of Financial Statements.PART II: FIXED INCOME SECURITIES.4. Time Value of Money.Web Extensions 4A: The Tabular Approach; 4B: Derivation of Annuity Formulas; 4C: Continuous Compounding.5. Bonds, Bond Valuation, and Interest Rates.Web Extensions 5A: A Closer Look at Zero Coupon Bonds; 5B: A Closer Look at TIPS: Treasury Inflation Protected Securities; 5C: A Closer Look at Bond Risk: Duration; 5D: The Pure Expectations Theory and Estimation of Forward Rates.PART III: STOCKS AND OPTIONS.6. Risk, Return, and the Capital Asset Pricing Model.Web Extensions 6A: Continuous Probability Distributions; 6B: Estimating Beta with a Financial Calculator.7. Stocks, Stock Valuation, and Stock Market Equilibrium.Web Extensions 7A: Derivation of Valuation Equations.8. Financial Options and Applications in Corporate Finance.PART IV: PROJECTS AND THEIR VALUATION.9. The Cost of Capital.Web Extensions 9A: The Required Return Assuming Nonconstant Dividends and Stock Repurchases.10. The Basics of Capital Budgeting: Evaluating Cash Flows.Web Extensions 10A: The Accounting Rate of Return (ARR).11. Cash Flow Estimation and Risk Analysis.Web Extensions 11A: Certainty Equivalents and Risk-Adjusted Discount Rates.PART V: CORPORATE VALUATION AND GOVERNANCE.12. Financial Planning and Forecasting Financial Statements.Web Extensions 12A: Advanced Techniques for Forecasting Financial Statements Accounts.13. Corporate Valuation, Value-Based Management and Corporate Governance.PART VI: CASH DISTRIBUTIONS AND CAPITAL STRUCTURE.14. Distributions to Shareholders: Dividends and Repurchases.15. Capital Structure Decisions.Web Extensions 15A: Degree of Leverage.PART VII: MANAGING GLOBAL OPERATIONS.16. Working Capital Management.Web Extensions 16A: Secured Short-Term Financing.17. Multinational Financial Management.APPENDIXES.A. Solutions to Self-Test Problems.B. Answers to End-of-Chapter Problems.C. Selected Equations and Data.D. Values of the Areas under the Standard Normal Distribution Function.Glossary.Name Index.Subject Index.